No two brides are alike, even identical twins part ways when it comes to personal style. So how do you find a dress you love and looks good on you? Start with the magazines, find styles you like and designers you love, and bring these photos with you when you go shopping. Familiarize yourself with dress styles and shapes, then you’ll know the type of fit you want and which designers make gowns that will fit your body like a glove. 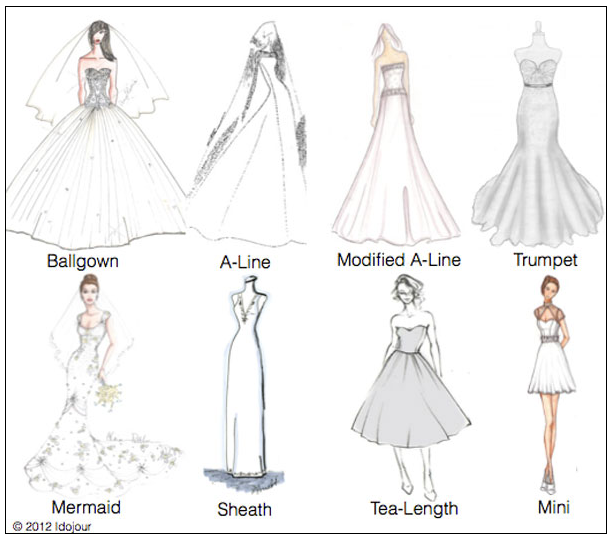 Here’s a dress chart to make it easier for you. You have to be prepared for gown shopping, it’s physically and emotionally taxing. Before you go make sure you’ve had a big meal, or at least brought some snacks to get you through. The gowns are heavy, and trying them on and taking them off can leave you exhausted at the end of the day. The makeup you wear to go gown shopping can make a difference too. You should wear roughly what you plan to wear on your wedding day, not the full amount, but the eyeshadow and lipstick for sure. This way you have a good idea of what your complete bridal look could be, and all the white from the gowns in the room won’t drain the colour from your face. Bring the heels or shoes you plan on wearing with your wedding dress, this also adds to the final product feel when you’re trying on the dresses. You try walking, sashaying and dancing to get an accurate idea of what the weight of the dress will feel like with your footwear. Tell the bridal consultant at the store the truth when trying on dresses, you don’t have to like everything you try on. Let the sales team at the boutique make suggestions and show them the pictures of the gowns you like so they can get an idea of your style. If you’ve brought your mother or mother figure along, try on her suggestions, even if you think there’s too many sequins on the dress, you might be pleasantly surprized. Lastly, remember that your undergarments can change the way the dress fits. The bra you choose to wear under the dress has to be able to support you under the weight of the dress. I chose a strapless bra that wound up pinching me between the gown and my bra. I had the largest blisters under my breasts I have ever seen, and it wasn’t pleasant for my honeymoon either! So ask as many questions as you feel necessary because this is the single most expensive dress you will ever buy and you want it to be fabulous and comfortable.